Did the elephants and apes want an autograph? Nicola Davis and Bill Oddie were part of a group of WLT supporters visiting Borneo recently in the hope of seeing rare wildlife. It seems all the animals wanted to come out and watch the visitors too. The group were there to look at the forest conservation projects that WLT supports and to meet some of the people working for our partner organisations in Sabah, HUTAN and LEAP Spiral. As Nicola commented: “they clearly packed a powerful planet-karma-punch: with Bill Oddie, (birder extraordinaire and gibbon funk artiste and a WLT Council member), Simon Barnes (wildlife journalist and sports writer for the Times and WLT Council member), David Bebber (Times photographer and frog enthusiast), Astrid Munoz (photographer, supermodel and WLT supporter), Mary Tibbett (WLT Programmes Coordinator for Asia and Africa) and Emma Beckett (PR consultant and rainforest defender).“ This was certainly a lucky group and the few days they spent on and around the Kinabatangan River were action packed with wildlife sightings. 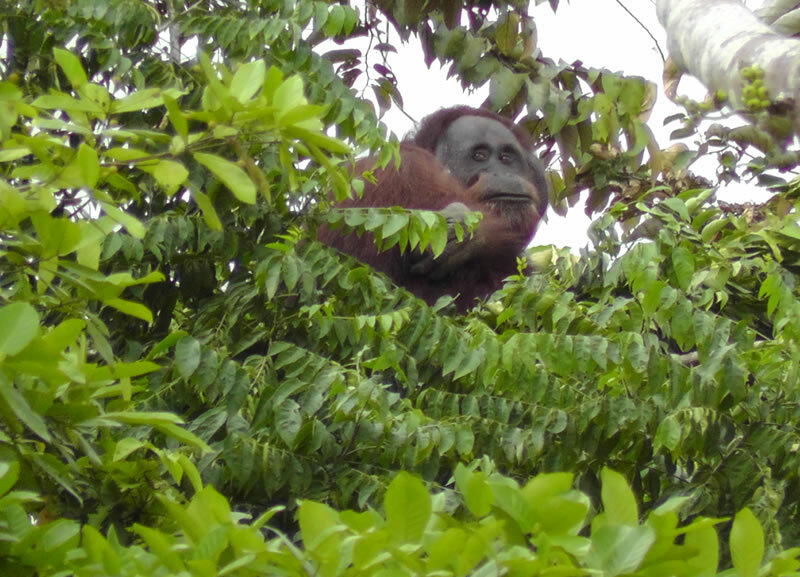 An adult Orang-utan took time out from building a nest to watch the WLT group as they passed by. Their wildlife extravaganza started from Day One, at the Tungog Eco Lodge, where, within minutes of arriving they were watching a Snake Bird, two species of kingfisher, a Bee-eater and an Indian Roller. A noisy group of Bushy Crested Hornbills arrived, a huge monitor lizard swam into view while a Pygmy Squirrel ran up and down a tree trunk in front of them. On a night trip they caught Slow Lorises in their torch beams and the morning light brought the ethereal sounds of gibbons calling through the tree tops. 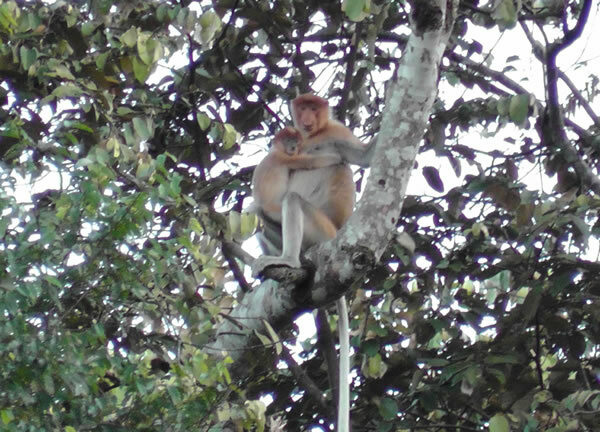 A female Proboscis Monkey was keen to show off her offspring. Two days on a boat and the wildlife appeared to be watching them from the shore. “Were the macaques trying to summon up the courage to ask Bill for an autograph? Were the six different species of hornbills there just to make sure Simon wrote a column about them? Did the herd of Pygmy Elephants cavorting in the water yards from our boat want to be sure of a double page spread in the Sundays? When an adult male Orang-utan stopped to peer down at us from the tree where he was involved in making his bed I wondered if he’s seen Astrid’s Vogue covers“, says Nicola. 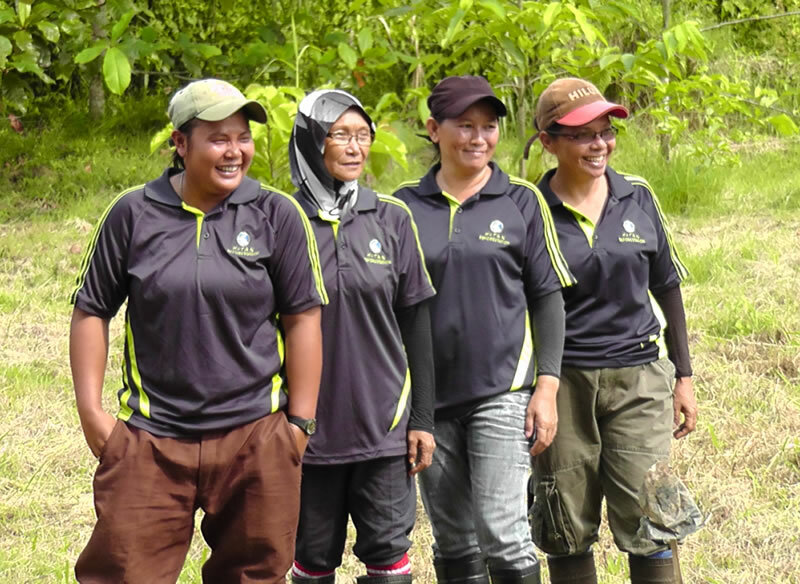 A group of HUTAN field staff welcoming the WLT group. 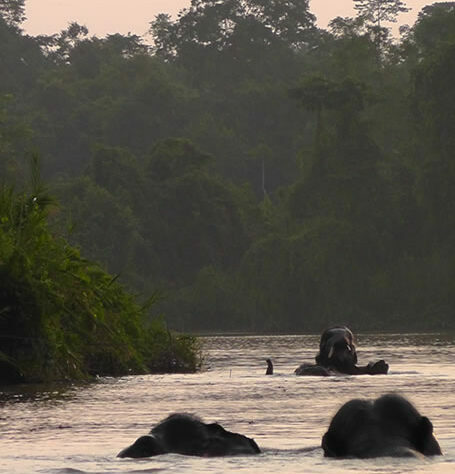 But of course it wasn’t all luck, the Kinabatangan river and the surviving forests are known to be extraordinarily rich in biodiversity. The bad news is that oil palm plantations are constantly nudging away at their edges, threatening their demise. The challenge is to protect the most diverse spots by private ownership or gazetting as reserves and replant bare patches to join up the mosaic of plots into continuous cover. This is what WLT with its partners, LEAP Spiral and HUTAN are concentrating on and there is a shopping basket of wonderful forest parcels just waiting to be saved. If we are able to raise the funds to link up the forests bit by bit we stand a good chance of ensuring that this part of Sabah continues to be one of the finest wildlife spots in South East Asia. You can support WLT’s conservation efforts in Borneo by donating to the Borneo Rainforest Appeal.